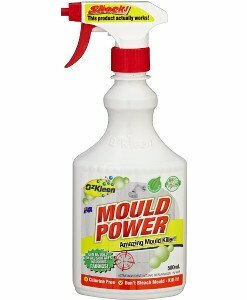 Unlike other mould cleaners, Mould Power does not contain chlorine, ammonia or phosphates, so it can be used to remove mould from your outdoor bean bags & patio furniture fabrics. Mould Power will kill mould spores and will prevent mould from forming. Mould Power will continue to inhibit germs / mould longer than most other cleaners. 3) Despite using chlorine-based products, many households still find mould keeps returning to the same spot, which tells us that chlorine-based products, even though they bleach the mould white, are limited in their effectiveness in killing mould spores.